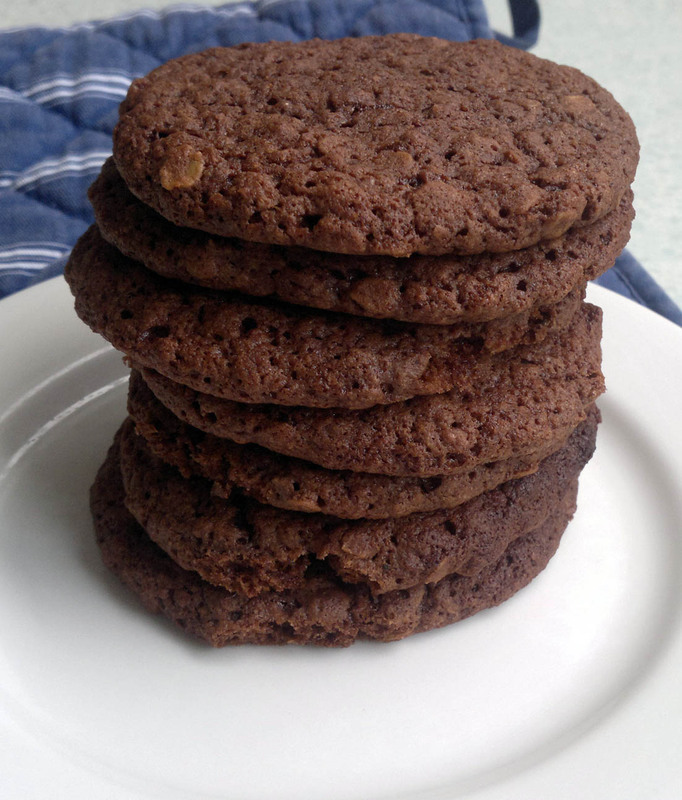 This week Caroline and Claire of Bake With Us chose Dorie's Chocolate Oatmeal Drops. I really love this sort of cookie. There's no creaming butter, you don't have to wait for the dough to chill and you don't have to roll them out. Just melt, mix, drop, bake and eat! I made just 1/4 of the recipe and got 10 large cookies. They disappeared in record time so I will definitely have to make another batch sometime soon. Next time I will leave a little more space between them on the tray though, these spread like crazy. I don't think I've ever really had oats in a chocolate cookie before but it was delicious. I upped the wholegrain aspect by using wholemeal flour which made me feel a bit better about scoffing down 3 of them for lunch! These were really tasty everyday cookies and I will be making them again. Make sure you check out Bake With Us for the recipe as well as the other TWD bakers here. good call on the wholemeal flour. i like that idea! these look good...mine didn't spread at all, though. I agree, that was a good call to use wholemeal, I think I will try that next time. Thanks for baking along with us this week! Wow, I should've made just 1/4 the recipe so as not to test my willpower, lol. great job all around! They look good Susan, and yes they tasted good! They turned out great..nice and fat! Mine spread ..I needed to chill the dough! Looking good and they were yummy. Yours look so perfect! Mine are certainly a bit rough around the edges. Very nice! The chocolate appears to be hiding any hint of healthy oatmeal...sneaky! Your cookies look so wonderful!! Nice job. yours look great. I loved how easy they were to make too! can't beat it. I remember eating oatmeal chocolate cookies a long time ago and I remember I absolutely loved them. But I guess I just forgot about them. Now, I have to thank you for reminding me of them. I’ll definitely go make some really soon. They look awesome. "Melt, mix, drop, bake and eat"; I like the sound of that!